…but his big brother Steph sure does. In this short interview, the former Davidson star (and the most recognizable Curry son—for now) calls Duke ‘a second chance’ for Seth after transferring from Liberty. Seriously, why didn’t big D-1 powers look at the Currys the first time around? Apparently, college basketball bloggers love having Duke recruit Austin Rivers write for them. Our top 2011 prospect discusses a comparison to Tyreke Evans and his plans to improve his skills this summer. Thanks, Andy. Duke is followed by two Big 10 20 powers, Purdue and Michigan State, in these very very pre-season rankings. I don’t see us budging from number one too much next season. One of the elder statesman of the League still has it. And maybe a book is on the way? Good luck guarding Kobe, G-Hill! Go Suns, seriously. @Ndotsmitty’s championship ring wants a friend. Nolan is working out at the Accelerate Your Game facility outside of D.C. this summer, along with Kentucky’s erstwhile forward DeMarcus Cousins (who should probably just shut his mouth forever). Improved speed and vertical leap? Look out. 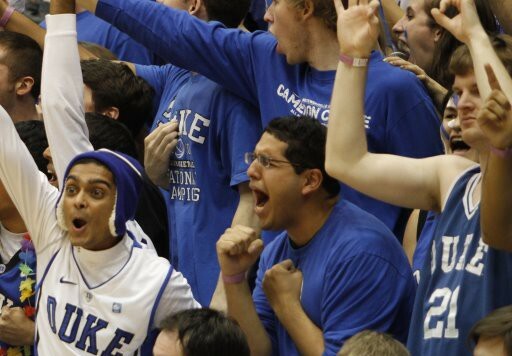 And the Duke army grows…If you have Twitter, follow @jhairston15! He has a great background. Congratulations to LT, Zoubs, Jon and Jordan on their graduation! Hope you guys enjoyed listening to speaker Muhammad Yunus more than I did.